Great Plains pastors got a healthy dose of information on self-care during the 2019 Orders & Fellowship gathering. “Living Water, Living Well” was the theme for the annual clergy gathering, Jan. 16-17 at the United Methodist Church of the Resurrection in Leawood, Kansas. The two-day sessions’ keynote speaker, Rae Jean Proeschold-Bell, has spent 11 years as research director of the Duke Clergy Health Initiative, as well as serving as associate professor of global health at Duke University. 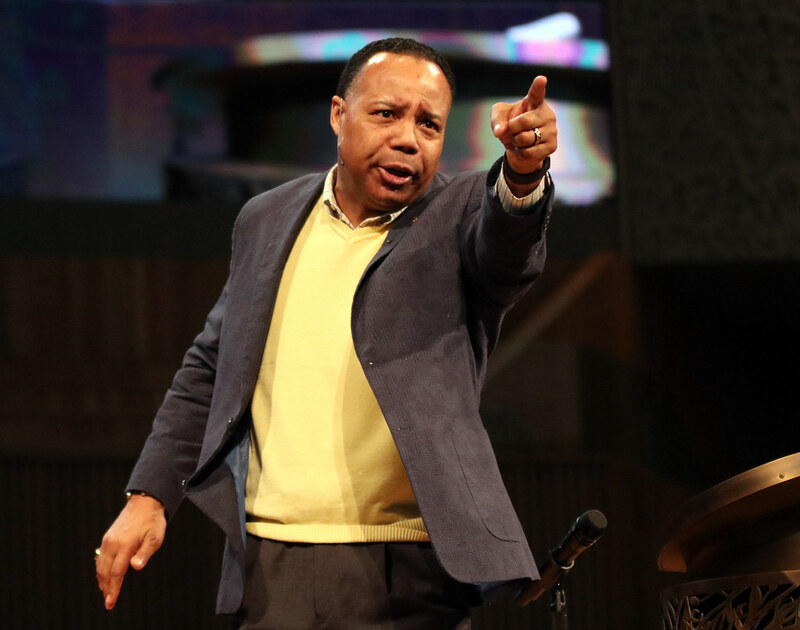 A positive mental attitude, Proeschold-Bell told the 600 clergy, is the difference between a pastor who is flourishing and one who experiences mental health challenges and burnout. Were intentional and flexible in regularly engaging in healthy practices. Realigned frequently with God’s work. Reached out to supportive people, including sharing successes. The flexibility extended beyond healthy practices into their daily lives, Proeschold-Bell said. Those with negative attitudes, Proeschold-Bell said, had high congregational demands, critical congregants and what they viewed as life unpredictability. Flourishing pastors, she said, had congregations that were open to newcomers and new ideas, parishioners who supported them as a person and took the pastor’s gifts into account. Pastors with low mental-health levels, her research said, had a history of depression, were caregivers (generally to an older or younger generation), found it a challenge to make social connections and had a lack of self-acceptance. No conditions that the pastors were in – small, medium or large churches; longtime pastors vs. newcomers; or male-female – made the situations better or worse, Proeschold-Bell said. Pastors, she said, were “bad” at two things: Giving themselves permission to recharge (whether it be a weekly Sabbath or yearly vacations – “You all aren’t particularly good at it,” she said. “The world won’t fall apart, because it’s still in God’s hands”) and forgiving themselves. The best part of making the mental adjustments that lead to better physical health is that it doesn’t take a major overhaul of one’s life, Proeschold-Bell said. “It’s my belief that it’s the small practices that are going to make a difference,” she said. See more about the worship and our venue in a notebook of items from the 2019 Orders & Fellowship clergy gathering. In a candid talk with the pastors at Orders & Fellowship, Bishop Ruben Saenz Jr. told of the changes he made when his physical health was spiraling out of control. A college football lineman who gained 35 pounds in three months when he was 19 — with a daily diet of a whole chicken, 18 eggs, a half-jar of peanut butter, bananas and ice cream — the bishop said that in 2013 he weighed 335 pounds. He had “brain fog,” was always thirsty and hungry, had high blood sugar and cholesterol, and suffered from sleep apnea. After frank talk from his wife, Maye, who told him he might not live to walk his daughter down the aisle at her wedding nor get to play with grandchildren one day – plus make himself available to serve as an episcopal leader – he set out on an exercise and diet plan that has him down 85 pounds from his peak weight. He keeps to a 2,300-calorie daily diet and a regular exercise regime. He also follows many of the ideas that Proeschold-Bell gave to the clergy, including regular vacations and delegating duties. “I have to rely on God for the grace and strength every day, just to be accountable to myself,” he said.